It’s no secret I love to use scraps that might otherwise go to waste to create something beautiful and useful. I’ve made trays, a small shadowbox, an in drawer knife block, state shaped art, pedestals to elevate orinary objects to name a few projects. Clearly I love the free and usually easy concept. 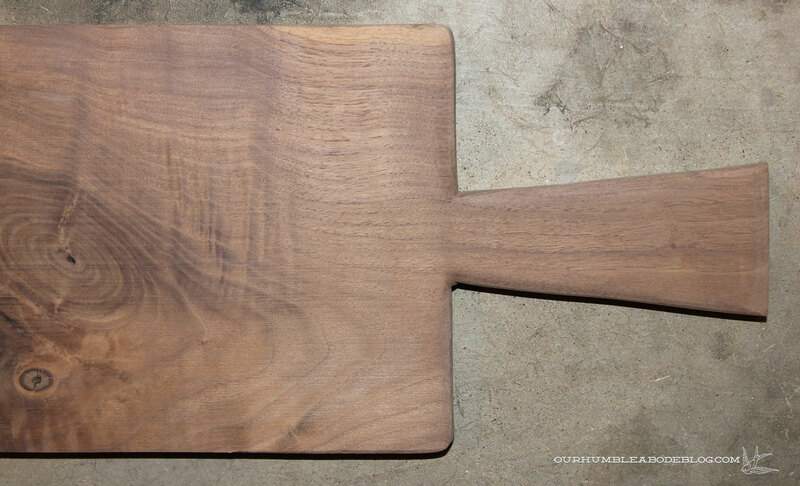 With small sections of walnut left over from the island, I decided to make a long, narrow bread board. 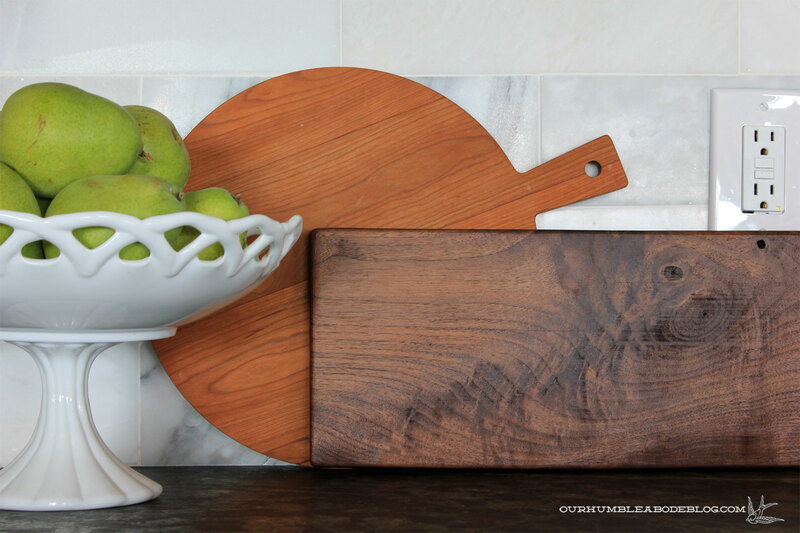 Of course a rectangle of wood would work, but I decided to create a handle for detail that is more display worthy. To start, I cut my board to length, then taped the end to easily draw my handle design on the dark wood. Using a hand saw-a jig saw would be great, but I didn’t want to waste time searching for ours amongst the chaos-I cut straight lines, notching out the handle. To make the board look older and smooth the rough edges, I rounded everything using 120 grit paper on an orbital sander. Just evenly run along with the sander to ease the edge, also rounding the outside corners. Flip and reapeat. 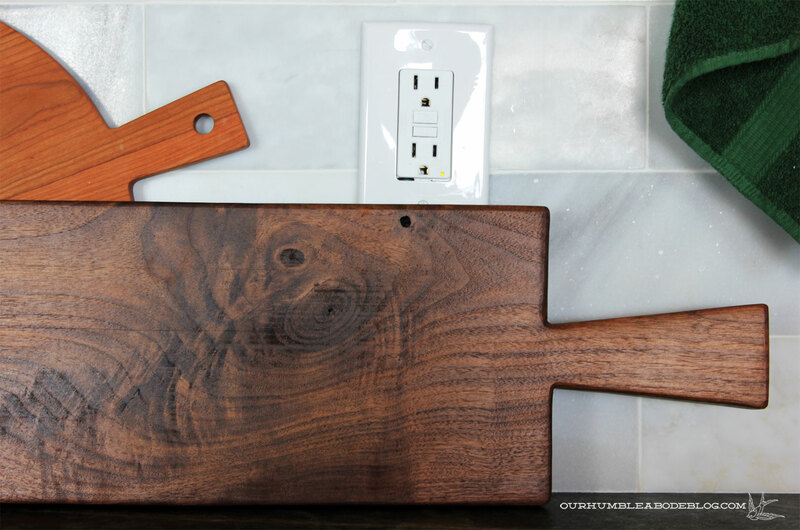 Add a few coats of oil enhance the grain and protect the board from water and stains. 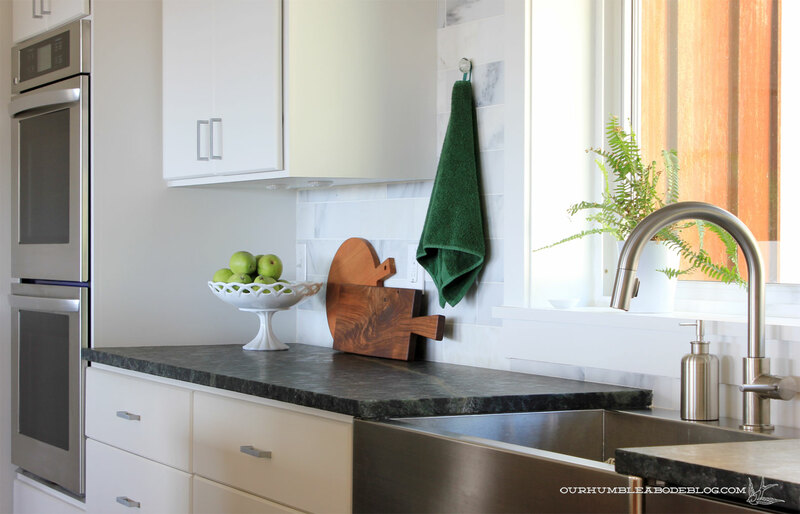 With the white of the kitchen, I like having a warm wood tone on the counter and it carries the walnut over from the island. 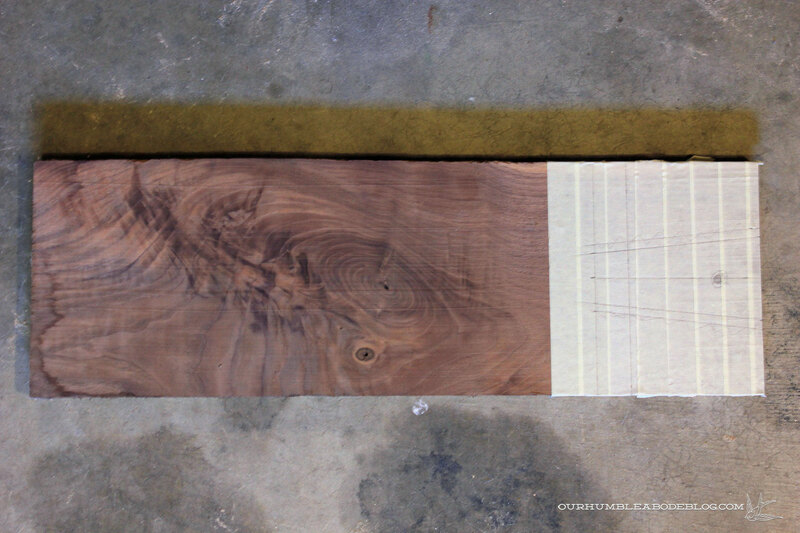 Bonus points if your scrap wood has a pretty knot or grain detail to add even more character. The best part is, I spent zero dollars and about 30 minutes creating this functional kitchen display. 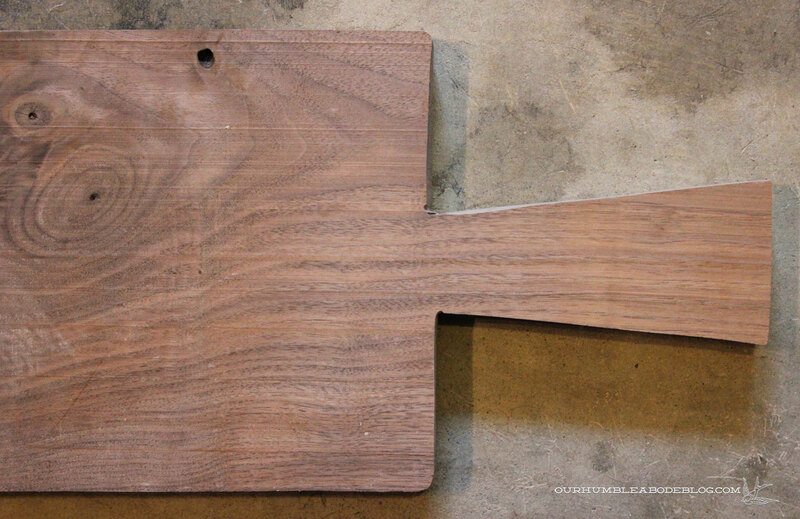 Of course, now I want to make more, or perhaps a larger serving tray. The eternal ‘if you give a mouse a cookie’ syndrome going on. Target isn’t helping the situation with their beautiful, useful kitchen accessories like this dutch oven. Soup is a favorite this time of year and a big cast iron pot would be nice for large batches. How cute are the copper measuring spoons (and the stainless measuring cups)?! We could use a set to replace the plastic ones we have because the lettering has worn off, so the stamped design would remain after use and washings. 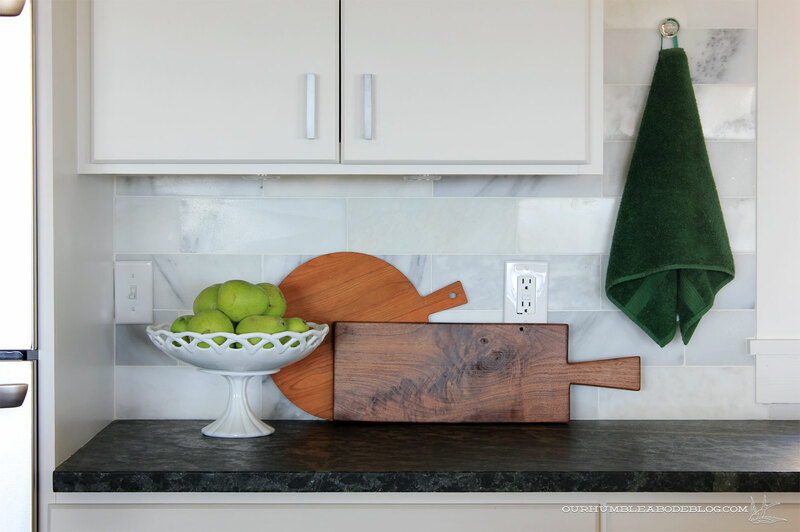 Though we have small ceramic containers near the stove for salt and pepper, I’d love a set of the wood salt cellars with the swivel lids, perhaps on this marble lazy Susan. I’ve been so great limiting my Target purchases to needs, but this season’s selection is making that very difficult. I can justify the three listed above though, so we’ll see if I can resist the urge. And I’m so glad you mentioned Target. I was in one the other day and stumbled into their design section – it’s a new, very chic area they have started adding to their stores. For a minute there I thought I was in Crate & Barrel. They had all sorts of copper accents I was swooning over – have you seen the copper votive holders they have right now? Off to shop today, ha!